After overcoming a range of emotional extremes in reaction to this production (Branagh Shakespeare on stage... sold out! Live screening... A night I can't attend! Realize I have read the date wrong... Exchanges the curse called down upon National Theatre Live for a blessing.) it was with great excitement I headed to my local cinema to catch some Scottish Play action. 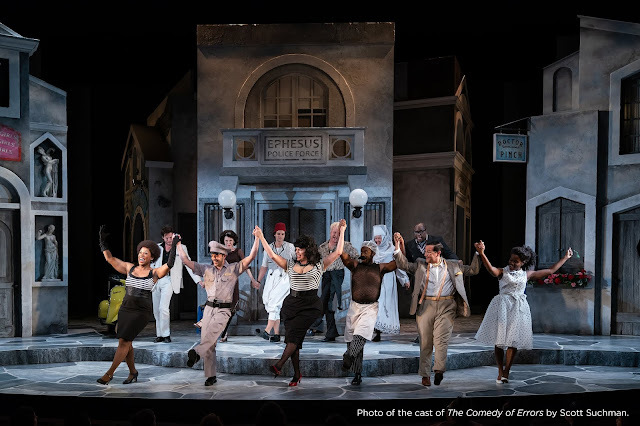 Performed in a de-consecrated church, Branagh's Co-Directed production for the Manchester International Festival brought the production a distinctive, mediaeval morality play atmosphere. 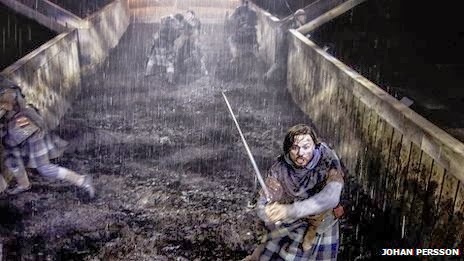 The aisle was bestrewed with mud and clay, rain pouring from the flies as the ensemble sloshed about in rain soaked tartan, covered with thick mud and gore. Muted wools and heavy pelts of fir bedecked our kings whilst swords and Claymores caught dangerously close to the congregation present. We were hurled head long into the hurly burly of this brutal world. During this opening battle (eschewing the ethereal first scene for the earthiness of war) kneeling and praying in the nave,surrounded by candles, was a veiled figure - the light counteracting the darkness of battle. But this production revelled in darkness in more ways than one. As the action progressed and the Macbeth's descended further into their personal and political quagmire, the candles slowly burned down and were blown out. Lurking at the other end of the aisle in blocked out windows, skulked the twisted, besmirched witches. Seen chiefly by the whites of their eyes and often running between our protagonists laughing with malevolent glee, they provided a deeply sinister surround to the fall of Scotland. 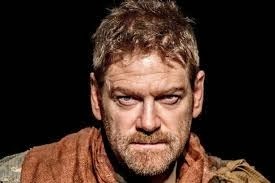 Any regular readers of these epistles will know my views of Branagh (to him I owe my first true love of Shakespeare.) and so my praise of his performance will not come as a surprise. Managing to accomplish that rare feat of imbuing Macbeth with a genuine sense of tragedy,we watched as the words "murder" and "treachery" almost physically stuck in his throat. These grew, gradually becoming physical twitches and dead eyes as moral corruption kicked in. 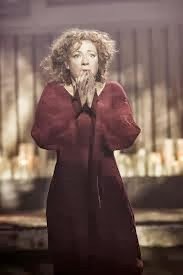 Alex Kingston made a memorable and convincingly powerful lady M. Praying veiled as the play opens she to moves from the heavenly to the hellish, heading to the darkness and streaking her hands with mud as she anxiously yet defiantly makes her pact with evil to be "unsexed". Interestingly, from the off, she is excitable and highly strung making her descent into candle carrying madness all the more believable. The relationship between the two was also compelling, portraying a depth of passion and tenderness, both aspects refreshing in the roles. Branagh's grief stricken response to her death was both powerful and painful. Mention must also go to the ensemble. It looked like a hot night and two hours of running in tartan under stage lights deserves a hearty bravo in my book. 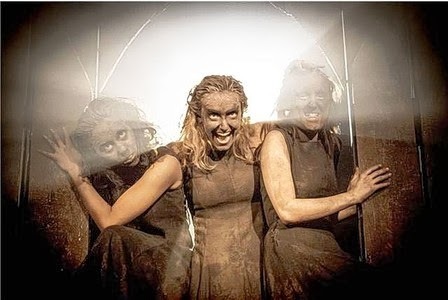 A powerful, chilling production which gave evil centre stage.